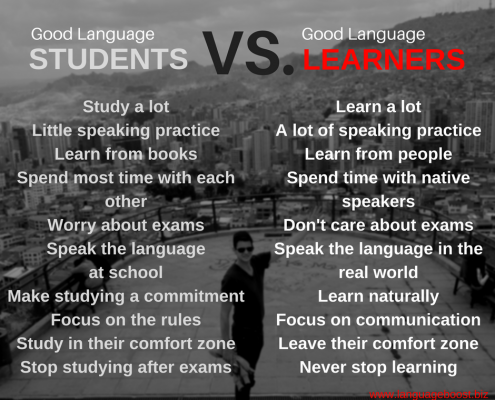 Being a Good Student Vs. Good Learner - Which one are you? Have you ever thought about the differences between being a good student and a good learner? Can being one or the other make you more successful in your language-learning journey? While I was studying languages at school, I put the time and effort into studying and I was determined to pass my exams. However, although I was a good student, I was a poor learner. In fact, I wasn’t really good at studying languages at school. For example, I started studying English when I was 14, and by the time I graduated 4 years later, I was one of the worst students in my class. So, what happened since then, and what has changed now that I am able to speak 10 languages? Well, I became a good learner, not necessarily a good student. In this blog post, I would like to share with you, the reasons why I was so unsuccessful at studying languages at school, why I became a good learner, and how you can become a good learner too. The original video where I talk about this topic, shot in Lima, Peru. When you go to school, there is all this expectation from your parents, your teachers and even yourself to perform well, get good grades and finish all your tests and exams successfully. So, you put the time and effort into studying only to pass a certain exam. Actually, putting an effort into learning is always a good thing. But, the difference between a good student and a good learner lies in the fact that a good student will study hard for their test, and once the test has finished, they will lose motivation for studying further. There is simply no reason to continue learning. So then, further studying is no longer necessary and the learning process is finished. A good learner, on the other hand, will never stop learning. A good learner understands that the reason for studying is not to fulfill an obligation or to pass the test. You study for yourself. For this reason, a good learner will always keep on learning because he will always want to know more. Not only that, but a good learner will want to use what he has learned. This makes the person excel faster in his ability to actually speak the language – something you don’t often get a chance when you learn a language at school. So, in my case, while I was studying languages at school, I was only studying to pass my exams. Now, however, I do still keep on learning, but I use what I’ve learned straight away in different situations and circumstances. This has helped me to develop my speaking abilities in a target language faster. Speaking practice is actually very important while you’re learning a new language. When you study a language at school, you don’t really get a chance to speak the language you’re learning. Yes, there are moments when you can practice with your teacher or other classmates, but you are never in a situation where you need to use what you’ve learned. This is what I mean – I’ve studied German for 4 years, but I never spoke a word of it! Was I able to speak German after those 4 years? Certainly not. I was able to understand some of the language, but I would have been too uncomfortable to try to use it. When I learn languages now, my studying-speaking ratio is about 50:50. I still need to put the time and effort into studying the language (input), but now I make sure I use what I have studied in actual conversations either with the native speakers or online language tutors. The reason why speaking practice is so important is that it’s a great confidence builder. You can study words and grammar, but once you’ve been put in a situation where you need to hear, understand and respond in another language, it puts a lot of pressure on you that very often you are unable to even recall what you’ve learned. Besides, once you start using the language, you gain so much confidence that it inspires you to learn more and more. So, together with being a good student, adopt the attributes of a good learner,and use as much of the language you’ve learned as possible. You will be surprised at how fast your abilities to speak will develop and how little you will care about making a mistake while speaking. When I’m learning a new language, I try to at least spend 50% of my ”study” time on speaking practice. Photo: Me practicing Portuguese online in Brazil. At school, the only learning materials available were books which were mandatory for the certain subjects. Books are a great resource for language-learning. But, to enhance your speaking abilities, books can’t be the only materials you use. When I learn a new language now, I try to learn from every resource imaginable – articles, different language courses, movies, podcasts, song lyrics and, the best resource of all – native speakers. The more associations you make with words, the better you will remember them. Using different resources enables you to build multiple associations to the words you’re learning. Not to mention that you will also hear how the words are pronounced and you will be using multiple input methods. When I was studying Chinese in China, a lot of the students hung out together after the class, speaking Dutch to each other. While it was a great way to get to know the other students, it didn’t help much to use what was being learnt in class. On the other hand, I wanted to go out there and speak with the natives. At the time, I had a Chinese girlfriend, which forced me to use all of my learnt Chinese. The result was that after 6 months, I was able to communicate pretty well in Chinese. Speaking with the natives will certainly push you out of your comfort zone, but nothing will enhance your language abilities faster and better. It is understandable that not all of us are – able to travel to the country where the target language is spoken. For this reason, you can learn a language from native speakers from the comfort of your own home. We offer specialized Boostcamps for intensive language learning courses. There are also a number of internet platforms and social networks which offer lessons from native speakers, such as italki, WeSpeke, Langademy, and others. Although I learned most of my languages online, here I took the chance to practice my Chinese during a late night BBQ with locals somewhere in the south of China. Good learners don’t worry so much about exams because they know that’s not the reason they’re learning a language. If you learn a language, you learn it for yourself, and not for your teacher, or parents. The key to successful language learning is motivation. If your motivation to learn a language lies only in the fact that you want to pass an exam, or you want to fulfill some requirement, your learning will end the moment you fulfill that goal. However, if your motivation goes further than that, the probability is that you will never stop learning that language. Learning a new language can change your life. Imagine you’re starting work in a new country, or your significant other is from another culture… All of these are great motivations to dig deeper and stay more motivated throughout your learning process. So, ask yourself, what is it that motivates you the most to learn the new language? At school, you practice speaking with other students or your teacher, in an artificial environment. This is fine for some time since there are no other possibilities around to use the language. However, you can practice your speaking everywhere, especially during your travels when you speak to native speakers or people who have learned that language already. Being able to speak with the natives gives you extra motivation. Once you successfully complete your first conversation with the native speaker, it will encourage you to learn more and speak more. Speaking with the natives also gives you a feel for the culture and the language. There’s no better way to experience a new culture than mingling with native speakers, or with other people who speak your target language really well. It’s good to learn the basics of a foreign language in a classroom or by yourself, but in order to become fluent you need a lot of speaking practice that you won’t get in a classroom. 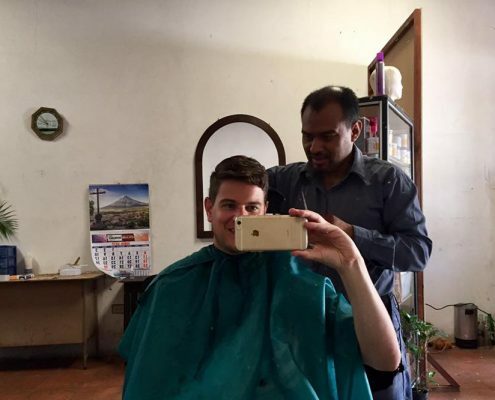 Photo: getting some intensive Spanish practice at the local hairdresser in Guatamala. Learning a language is a commitment. You have to put in the time and the effort to study, whether you studying it at school or on your own. However, a commitment to study a language doesn’t have to be hard and doesn’t have to feel like an obligation. In fact, I see it as something which is exciting and great fun. There are many apps available which make your learning process easier and more fun. For example, if I have extra time while traveling, I use apps like Anki or Lingq to study. It doesn’t take too much time or effort, but it’s effective. We are more effective in anything we study, when we study it because we want to, and not because we’re forced to. The school system often puts pressure on students to achieve certain accomplishments and, that in itself can make your learning process dreadful, hard and boring. However, once out of school, you have the freedom to study what you want and to go at your own pace. I also believe the key point is knowing that you can do it! You can learn a new language. Once you have learned at least one language, learning another one and yet another one won’t seem like an impossible task. In fact, you’ll view it as a fun challenge which will bring you lots of enjoyment and it can even become a fun hobby. It is common to focus on learning words and grammar once you start learning a new language. In order to communicate, we need to develop our vocabulary, of course. But, spending too much time on learning the vocabulary and not enough time using the vocabulary we have learned will cripple our progress. So, in the beginning, I do always focus on the vocabulary, not so much on grammar. Grammar is something you can learn along the way. You learn the words and the sentence structures first, and once you are able to form sentences, you start paying attention to the grammar. If you notice a certain grammar rule repeating in the sentences, it would be a good time to look it up online or in a grammar book and learn it. You learn through input, but also through output while speaking with a tutor or a native speaker. This way of learning is more natural than spending hours and hours on memorizing words and grammar rules you never use. You may end up with quite a large vocabulary with no confidence to use it. To avoid this, always focus on communication just as much as you focus on expanding your vocabulary. The moment you learn a new word, form a new sentence with it so that you will remember it better. At school, I always stayed in my comfort zone. I wasn’t challenged enough to use the language I was learning, and since I was in a surround which understood my native language, I was in no fear of communicating with the people around me. However, getting out of your comfort zone is usually the main thing that will rapidly enhance your language learning abilities. You need to get over your fear of making a mistake while speaking. Mistakes will happen, even in your native language. No need to dwell on them and let them keep you from practicing the language. I use the language at every chance I get and I don’t care so much anymore if I make mistakes. I push myself out of the comfort zone. This is something you simply have to do with language learning. Naturally, I still make mistakes, people still misunderstand me and there’s still miscommunication, but I don’t care so much, because I know that people don’t mind. If you’re making an effort to speak to them in their own language, they will appreciate it more than your mistakes. The bottom line is – get out of your comfort zone! There is a great quote by Jim Rohn which says: “If you keep on doing what you’ve always done, you will keep getting what you’ve always gotten”. If you want to become better in another language, you need to do things you’ve never done before. And, always remember, it’s ok to make mistakes! 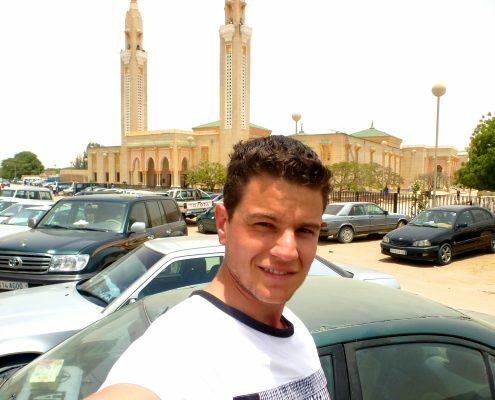 After learning French for a month in Morocco I went on a trip to Mauritania and Senegal (over land) to see if I could survive by just speaking French. It worked out but the trip was everything but relaxing. Great students put a lot of time and effort into preparing for their tests at school. Once the test is done, they usually never pick up the book again. The learning process for them has ended and they can never excel further unless they find the motivation to keep on learning. I don’t have any certificates for the languages I speak because I don’t learn them for the sake of others, but for myself. I find language learning fun and I enjoy the process very much. There are certain languages I speak better than others, but even in your native language, there are still things you can learn. Good learner never stops learning. One can be a great student without actually being a great learner. Learning something for the sake of passing an exam, for example, isn’t going to produce very good results long term. My advice is to first find real motivation behind your language learning, one that will keep you on track even when you get tired or frustrated. Remember that you’re learning a language for yourself, and not to fulfill some obligation or goal. Second, make sure you always use what you’ve learned so that you can practice speaking. Being able to communicate in another language is what you’re striving for so keep communication at the center of your language-learning process. Always try using multiple resources which will help you make better associations with the words you’ve studied. Last, but not least, have fun! Learning a new language is a great hobby, one that can boost your confidence. Visit our website for great learning materials and check out our YouTube channel for more tips, tricks, and motivation for language learning. Show me how I can learn languages quickly! 5 Great Reasons to Learn Spanish Is French Hard to Learn?